Not a "Natural Born Citizen"
When developing a new U.S. Constitution for the United States of America, Alexander Hamilton submitted a suggested draft on June 18, 1787. In addition, he also submitted to the framers a proposal for the qualification requirements in Article II as to the necessary Citizenship status for the office of President and Commander in Chief of the Military. "No person shall be eligible to the office of President of the United States unless he be now a Citizen of one of the States, or hereafter be born a Citizen of the United States." Many of the founders and framers expressed fear of foreign influence on the person who would in the future serve as President of the United States since this particular office was singularly and uniquely powerful under the proposed new Constitution. This question of foreign influence was elevated when John Jay considered the additional power granted to the Presidency during times of war, that is when he serves as Commander in Chief of the military. Jay felt strongly that whoever served as President and Commander In Chief during times of war must owe their sole allegiance to and only to the United States. 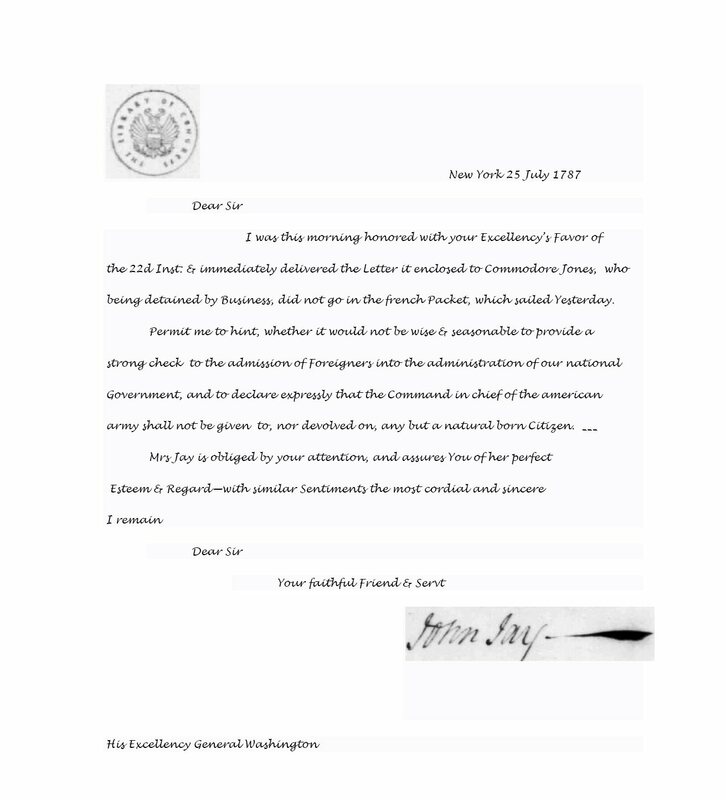 Because this fear of foreign influence on a future President and Commander in Chief was strongly felt, Jay took it upon himself to draft a letter to General George Washington, the presiding officer of the Constitutional Convention, recommending/hinting that the framers should strengthen the Citizenship requirements for the office of the President. John Jay was an avid reader and proponent of natural law and particularly Vattel’s codification of natural law and the Law of Nations. In his letter to Washington he said that the Citizenship requirement for the office of the commander of our armies should contain a “strong check” against foreign influence and he recommended to Washington that the command of the military be open only to a “natural born Citizen”. Thus Jay did not agree that simply being a “born Citizen” was sufficient enough protection from foreign influence in the singular most powerful office in the new form of government. Rather, Jay wanted to make sure the President and Commander In Chief owed his allegiance solely to the United States of America. He wanted another adjective added to the eligibility clause, i.e., ‘natural’. And that word ‘natural’ goes to the Citizenship status of one’s parents via natural law. "Permit me to hint, whether it would be wise and seasonable to provide a strong check to the admission of Foreigners into the administration of our national Government; and to declare expressly that the Command in Chief of the American army shall not be given to nor devolve on, any but a natural born Citizen." See a transcription of Jay’s letter to Washington at this link. 3. Rep. John Bingham, Principal Framer of the Fourteenth Amendment of the U.S. Constitution. Notice that Bingham declares Houard to be a “natural-born citizen” by citing two factors – born of citizen parents in the US. "Vattel, who, though not very full to this point, is more explicit and more satisfactory on it than any other whose work has fallen into my hands, says: “The citizens are the members of the civil society; bound to this society by certain duties, and subject to its authority, they equally participate in its advantages. The natives or indigenes are those born in the country of parents who are citizens. Society not being able to subsist and to perpetuate itself but by the children of the citizens, those children naturally follow the condition of their fathers, and succeed to all their rights." "Ann Scott was born in South Carolina before the American revolution, and her father adhered to the American cause and remained and was at his death a citizen of South Carolina. There is no dispute that his daughter Ann, at the time of the Revolution and afterwards, remained in South Carolina until December, 1782. Whether she was of age during this time does not appear. If she was, then her birth and residence might be deemed to constitute her by election a citizen of South Carolina. If she was not of age, then she might well be deemed under the circumstances of this case to hold the citizenship of her father, for children born in a country, continuing while under age in the family of the father, partake of his national character as a citizen of that country. Her citizenship, then, being prima facie established, and indeed this is admitted in the pleadings, has it ever been lost, or was it lost before the death of her father, so that the estate in question was, upon the descent cast, incapable of vesting in her? Upon the facts stated, it appears to us that it was not lost and that she was capable of taking it at the time of the descent cast." "The citizens are the members of the civil society; bound to this society by certain duties, and subject to its authority, they equally participate in its advantages. The natives, or natural-born citizens, are those born in the country, of parents who are citizens. As society cannot perpetuate itself otherwise than by the children of the citizens, those children naturally follow the condition of their parents, and succeed to all their rights.' Again: 'I say, to be of the country, it is necessary to be born of a person who is a citizen; for if he be born there of a foreigner, it will be only the place of his birth, and not his country. . . ."
"The Constitution does not in words say who shall be natural-born citizens. Resort must be had elsewhere to ascertain that. At common law, with the nomenclature of which the framers of the Constitution were familiar, it was never doubted that all children born in a country of parents who were its citizens became themselves, upon their birth, citizens also. These were natives or natural-born citizens, as distinguished from aliens or foreigners. Some authorities go further and include as citizens children born within the jurisdiction without reference to the citizenship of their parents. As to this class there have been doubts, but never as to the first." "At common law, with the nomenclature of which the framers of the Constitution were familiar, it was never doubted that all children, born in a country of parents who were its citizens, became themselves, upon their birth, citizens also. These were natives, or natural-born citizens, as distinguished from aliens or foreigners." was a decision by the Supreme Court of the United States that a child born in the United States to naturalized parents on U.S. soil is a natural born citizen and that the child's natural born citizenship is not lost if the child is taken to and raised in the country of the parents' origin, provided that upon attaining the age of majority, the child elects to retain U.S. citizenship "and to return to the United States to assume its duties." Not only did the court rule that she did not lose her native born Citizenship but it upheld the lower courts decision that she is a "natural born Citizen of the United States" because she was born in the USA to two naturalized U.S. Citizens. "But the Secretary of State, according to the allegation of the bill of complaint, had refused to issue a passport to Miss Elg 'solely on the ground that she had lost her native born American citizenship.' The court below, properly recognizing the existence of an actual controversy with the defendants [307 U.S. 325, 350] (Aetna Life Ins. Co. v. Haworth, 300 U.S. 227 , 57 S.Ct. 461, 108 A.L.R. 1000), declared Miss Elg 'to be a natural born citizen of the United States' (99 F.2d 414) and we think that the decree should include the Secretary of State as well as the other defendants. The decree in that sense would in no way interfere with the exercise of the Secretary's discretion with respect to the issue of a passport but would simply preclude the denial of a passport on the sole ground that Miss Elg had lost her American citizenship." Bingham’s first attempt failed and he resurrected H.J.R. 33: in 1977 under H.J.R. 38:, again failing to gain support from members of congress. Bingham was a Yale Law grad and member of the secret society Skull and Bones, later a lecturer at Columbia Law and thick as thieves with the United Nations via his membership in the Council on Foreign Relations. 1. On June 11, 2003 Democrat House member Vic Snyder [AR-2] introduced H.J.R 59: in the 108th Congress – “Constitutional Amendment – Makes a person who has been a citizen of the United States for at least 35 years and who has been a resident within the United States for at least 14 years eligible to hold the office of President or Vice President.” – Co-Sponsors: Rep Conyers, John, Jr. [MI-14]; Rep Delahunt, William D. [MA-10]; Rep Frank, Barney [MA-4]; Rep Issa, Darrell E. [CA-49]; Rep LaHood, Ray [IL-18]; Rep Shays, Christopher [CT-4]. 4. On September 15, 2004 – as Barack Obama was about to be introduced as the new messiah of the Democrat Party at the DNC convention, Rep. Dana Rohrabacher [CA-46] introduced H.J.R. 104: – “Constitutional Amendment – “Makes eligible for the Office of the President non-native born persons who have held U.S. citizenship for at least 20 years and who are otherwise eligible to hold such Office.” – No co-sponsors. As you can see our past presidents eligible after the grandfather clause of Article II, Section 1, Clause 5 were all born on U.S. soil to Citizen parents. So there you have the facts of this roaring debate in a nutshell. The people are dismissed as clueless while the congress, the media, the current crop of presidential contenders, the Republican and Democrat Parties and the legal system are all living in a fantasy land. The people are 100 percent correct, and the people have every intention of showing those who continue to obfuscate this extremely serious constitutional crisis the door. I don't presume to be the sharpest tool in the shed. I stand on the shoulders of many people greater than myself by attempting to bring together the best sources of reliable information. I try my best to research to get to the truth and connect the dots. Don't just take my word for it. Do your own homework. While Vote for the Constitution cannot monitor every statement made on this site, individuals are encouraged to report violations of the policy of this website to patriotrodney@gmail.com. Obama Unconstitutional President reserves the right to delete any post, and/or to terminate the posting and participation privileges of any individual, without notice, at its sole and unfettered discretion. America in Wonderland does not necessarily endorse any comment or web site posted and are for information and research purposes only.